From February 1 through May 30 of any year, an approved marine mammal observer must be present aboard disposal vessels transiting between a dredge site and the Massachusetts Bay Disposal Site during daylight hours. Disposal vessels including tugs, barges, and scows, shall operate at speeds exceeding 5 knots after sunset, before sunrise, or in daylight conditions where visibility is less than one nautical mile. Disposal shall not be permitted if these requirements cannot be met due to weather or sea conditions. In that regard, the permittee and contractor should be aware of predicted conditions before departing for the disposal site. The intent of this condition is to reduce the potential for vessel collisions with endangered species, including right whales and sea turtles. When threatened or endangered species were observed to be present, the vessel captain would, except when precluded by safety considerations, follow the advice of the Fathom Resources (Fathom) marine mammal observer to avoid harassment of or direct impact to individual animals. A Corps of Engineers Marine Mammal Observation Report was to be fully completed by the Fathom observer for every sighting and faxed to various oversight agencies, within one week of the trip date. The observer was also required to maintain contact with NMFS, Habitat and Protected Resources Division, and other recognized experts to provide and receive information regarding the presence and distribution of threatened and endangered species in Massachusetts Bay. 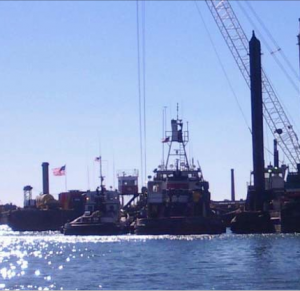 The intent of this work, was to reduce the potential for vessel collisions with threatened and endangered species, including right whales, and to minimize potential impacts of dredged material disposal on threatened and endangered species. Post lookout at all times during daylight hours when disposal vessels left the harbor and were underway or at the disposal site. Disposal vessels cannot approach threatened or endangered species closer than 100 feet. Disposal vessels must adhere to NMFS regulations for approaching right whales, 50 CFR Part 222.32, which restrict approaches within 500 yards of a right whale and specify avoidance measures for vessels that encounter right whales. If threatened or endangered species are sighted within 500 feet from the disposal point, dredged material cannot be released. In this case, the vessel captain may elect to wait until the animals move away from the disposal point prior to disposal, or, subject to the judgment of the observer, may dispose at a Corps- authorized alternative disposal location under the same restrictions noted herein for disposal at the primary disposal location. If threatened or endangered species are sighted. between 500 feet and 1500 feet from the disposal point, the observer shall note the animals’ behavior, relative position, and direction and speed of movement to determine if release of dredged material is likely to harass or endanger the animals. For example, whales actively feeding at or near the disposal point are more likely than resting whales to interact with released sediments. If the observer judges that disposal is likely to harass or endanger the animals, the observer shall inform the vessel captain and disposal shall be delayed until the animals change their behavior or move away such that the observer judges that no danger to the animals will result from disposal.